I first met la Virgen de Guadalupe in Laredo, Texas. As I was born and raised less than a mile from Tamaulipas, Mexico, it was inconceivable for me not to recognize her image-petite hands, palms together, solemn brown face gazing downward, her thick and forgiving eyelashes-impossible not to appreciate the way her celestial blue robe and gold aura made her beautiful and magical. Although quintessentially Mexican, she belonged to all Americans just the same. Later I would learn that she inspires communities beyond the Americas-from the inner sanctum of Nôtre Dame in Paris, France, to the Church of Guadalupe in Cebu City, Philippines. My elders taught me early on that piety is not something you talk about; it is something you do. Moreover, faith helps us survive hardship and allows us to look forward; it assures us that tomorrow can bring good news and better circumstances. My day-to-day realities did not exactly substantiate the idea that piousness resolves all, but they certainly made it an attractive possibility. Learning and growing in an environment where binational trade, intricate political networks, and ubiquitous power circuits thrive alongside drug cartels, horrific violence, and severe economic disparity unequivocally taught me that devotion-venerating la Virgen de Guadalupe, la Virgen de San Juan de los Lagos, la Santa Muerte, San Judas, San Miguel Arcángel, and el Sagrado Corazón-and self-preservation often go hand in hand. Although she was always near, la Virgen de Guadalupe's presence became pivotal when I moved to Chicago to attend graduate school. In a field methodology course at the end of my first year, my mentor, Dwight Conquergood, aware of my interest in the links among religion, economy, and political change, told me about a recent apparition of la Virgen de Guadalupe on a tree in Rogers Park-a multiethnic neighborhood on Chicago's Far North Side. Divided by Clark Street into East and West Rogers Park, each block along that main axis reflects the changing shifts of immigration to this modern port of entry: from quick-to-close West African and Peruvian eateries, to Jamaican jerk joints, to Mexican taquerias, the neighborhood showcases its high diversity index for commercial purposes. On the East Side, the vicinity exhibits leafy trees, generally well-kept single-family homes, apartment buildings, Loyola University, and easy access to Chicago's coveted lakefront property. The West Side, where I conducted my fieldwork, has a different feel. There are parks and big trees, but the houses are noticeably worn. Families inhabit multiunit buildings, some sharing two-room apartments. Along the edges of these buildings are pathways indicated by actual carpeting, which some residents use as either a shortcut to their houses or to stay off the main streets. There are also waves of gentrification evidenced by apartment buildings turned condo. From Howard Street, which separates Chicago from Evanston, to its southern border, Devon Street-also known as a principal marker of the neighborhood known as little India-the contrast between East and West Rogers Park is tangible. Dwight astutely suggested that I consider the occurrence in West Rogers Park as a possible case study for the practicum component of the course. I did. And inadvertently began to shape what would become a multiyear, multisited, transnational research project. Learning about the theoretical underpinnings of critical performance ethnography in the seminar room that spring quarter while realizing the practical and political implications of Dwight's favorite aphorism-"Opening and interpreting lives is radically different than opening and closing books"-in Rogers Park inspired the conceptual and methodological foundations of this study. Speaking from decades of experience as a performance ethnographer, he advised (1) the art of fieldwork is performance; (2) people are not fools; and (3) imagine culture as a matrix of boundaries, borders, intersections, turning points, and thresholds. He also cautioned, "If anything can go wrong in the field, it will." Many things did go wrong. On occasion I misspoke. I sometimes stumbled. I include some of those moments, not to draw attention to the researcher, but to relate the pitfalls and possibilities of co-performative witnessing-an approach that privileges embodied action as both an object and a method of study. This mode of research is a deeply politicized way of seeing and being in the field. Its point of departure is twofold. First, the ethnographer and the "subject" are always, and have always been, despite the insistence of more traditional ethnographic methods, engaged as interlocutors. Second, co-performative witnessing does not rely solely on texts housed in archives, oral histories, maps, or statistics but also foregrounds sensual communication-the rich subtext and often deeply coded moments of bodied exchange-that produce knowledge, ideas, opinions, mores, and traditions. This intimate method guided me as I conducted my fieldwork and took courses. Most days I would attend seminars, lectures, and other requisite meetings in Evanston and then walk from Northwestern University's landscaped campus to the prayer/community meetings held every evening on a street corner in West Rogers Park. I also took part in Guadalupan assemblies at the Second Tepeyac of North America in Des Plaines, Illinois-an institutionally sanctioned replica of the sacred hill of Tepeyac in Mexico City. The Second Tepeyac is situated in the borderland between urban and suburban space. Enclosed in a ninety-six-acre campus, it is further isolated by a panorama of trees on three sides and by a cemetery. This Guadalupan pilgrimage site, which maintains close ties (mimetically and officially) with its counterpart in central Mexico, has green areas, parking spaces, and peregrinos (pilgrims) to spare. Many times, I traveled to Des Plaines with Rogers Park Guadalupanos, the majority of whom are "unauthorized migrants" originally from traditional sending states such as Michoacán and Guanajuato but who also hail from Veracruz and Nuevo León. This migratory tie is important because it illuminates the long-standing transnational networks that bind Guadalupan sacred spaces together. Early-twentieth-century and post-World War II migration circuits connecting western and central Mexico-Michoacán and Guanajuato, for example-with the Midwest, especially South Chicago and the Pilsen and Little Village neighborhoods, help us trace the Virgin of Guadalupe's historical and contemporary influence in both countries. The case studies presented here are implicitly and deeply connected not only by shared interest in and devotion to the Virgin but also by underlying political economic ties. They offer examples of the living, breathing expressions of past devotees. Many of the Guadalupanos with whom I worked in the Chicago area are "newcomers" (or post-1965) migrants, but some are second- and third-generation residents. It is more important to acknowlege that the Virgin of Guadalupe was already traveling with train-track-laying and meatpacking migrant laborers well before that watershed moment in the master narrative of U.S. migration. Moreover, devotees in several places, along the pilgrimage route from Zitácuaro, Michoacán, to Mexico City or at the Second Tepeyac, revealed that they share family and social networks that connect these spaces every day (e.g., Mexico City to Des Plaines, Zitácuaro to Chicago). Newly arrived or long since established, the majority of adherents that congregated in Des Plaines did not find themselves aligned with fellow devotees at the Second Tepeyac on the basis of nationality. What connected them were their allegiance to la Virgen de Guadalupe and their determination to rise above the xenophobic realities of life in "el Norte." Those weekend pilgrimages to the Second Tepeyac provoked a set of key questions that ultimately determined the shape and scope of this study: (1) When is space sacred? Who determines its boundaries? How is it sustained and legitimized? (2) How do conceptions of sacred space in the United States and Mexico differ from place to place, from community to community vis-à-vis urban, suburban, and rural settings? (3) How are different forms of knowing, socioeconomic and political coping tactics, conceptions of history, and faith-based traditions circulated within and between these sacred spaces? Framing the project in this way requires a site-specific analysis, one that simultaneously privileges the production of space and the production of the sacred. Putting these two goals side by side presumes that space is not absolute, that the process of sacred space production embraces both religious and secular elements, often in unison. In the context of exploring Guadalupan shrine development in central Mexico and the Chicago area, it is imperative that we view the migration networks and the approaches to local integration as a process-as layers of culture, history, and traditions imbued in specific locations at specific times. Moreover, looking at the ways in which devotees have claimed (and will continue to) claim space gives us a chance to look critically not only at the categories of ethnicity, race, gender, class, and citizenship but also at the alliances and antagonisms that follow any immigrant group. This study seeks to reinforce the idea of connectivity among sacred spaces in disparate locations based on comparable embodied practices, oral traditions, and aesthetic/architectural choices, but it does so without defaulting to compartmentalizing or paraphrasing heterogeneous populations and deeply complicated intracommunity relationships that frequently transcend understandings of local context. After conceptualizing the project using a space production framework and co-performatively witnessing the construction of Guadalupan shrines in Rogers Park and Des Plaines over two and a half years (i.e. listening; witnessing devotees fight among themselves about money and power; seeing how devotees maintained sacred space with their labor, their expressions, and their material goods; fund-raising at dances and block parties; praying the rosary; laughing; remembering; singing; having heated discussions with police officers; negotiating with xenophobic neighbors; working alongside immigration lawyers; translating naturalization documents; tidying the shrine; cleaning up the mess left by vandals; weathering Chicago's extreme seasons; preparing and selling a wide assortment of Mexican dishes; celebrating the Virgin far from home with and alongside Guadalupanos who were far from home as well), it only made sense to try to grasp the fuller complexity of what Eric Wolf calls a "master symbol" by considering the Virgin's presence in central and western Mexico-a region where many Midwest-based devotees were born. That year I spent my time conducting archival research, learning about the backstage logistics of sacred space maintenance, co-performatively witnessing all-female walking pilgrimages, interviewing church officials, working with staff members in the Basilica's public relations office, speaking with peregrinos at Tepeyac and in their homes, and witnessing diverse modes of sacred space production. It became clear at the end of this fieldwork period that the project was, at its base, about the various processes-material, spatial, ideological, aesthetic, rhetorical, cultural, embodied-underwriting the production of Guadalupan shrines across the U.S.-Mexico border. One of the Virgin's geographic and temporal starting points is the hill of Tepeyac in the former metropolis of Tenochtitlán, capital of the Aztec empire (and present-day Mexico City). When Hernán Cortés and Spanish forces arrived in 1519 in Tenochtitlán they encountered a meticulously constructed island metropolis sustained by a well-oiled, tributary and warfare-based political-economic system. The Franciscan missionary fray Bernardino de Sahagún, among others, noted the verdant beauty and architectural perfection of the city's canal transportation system. In La Villa de Guadalupe: Historias, Estampas, y Leyendas, the historian Horacio Sentíes Rodríguez describes the sixteenth-century Tenochtitlán landscapes as possessing protective mountain ranges-the Sierra de Guadalupe and Sierra de Pachuca to the north, the Sierra de la Cruces to the west, the Sierra Nevada to the east, and the Sierra del Ajusco to the south-as well as bountiful lakes-Texcoco, Zampango, Ecatepec, Xaltocan, Chalco, and Xochimilco-that supported an intricate transportation system that guided goods and people across the city. Three calzadas (causeways)-Tlacopan, Iztapalapa, and Tepeyac-constructed in the pre-Tenochtitlán era by the Tlatelolcans, enhanced intracity communication and business networks. The hill of Tepeyac's geographic position guaranteed its political and economic importance through the pre-Hispanic and colonial epochs. Located at a northern point of the Calzada de Tepeyac, the "nariz del cerro" (lit., "nose of the hill"), operated as an important entryway into the city, not only for trade, but also for high-ranking ecclesiastical and civil figures arriving from the Iberian Peninsula. They announced and celebrated their arrival in the New World at Tepeyac before entering the city proper. It is important to note, however, that while Tepeyac was indeed an important religious stop, its appeal came primarily from its physical location. Accounts of this early colonization period also suggest that Spanish conquistadores (conquerors), in addition to bringing warfare, disease, and their dreams of accumulating wealth, transposed their cultural practices and their religious beliefs to the New World. Cortés, Francisco Pizarro, Vasco Nuñez de Balboa, Hernando de Soto, Sebastián de Balalcázar, Pedro de Alvarado, and other important figures from Extremadura, a region in central/western Spain, worshipped the Virgin Guadalupe of Extremadura in different locales across New Spain. Cortés, for example, is said to have worshiped the Extremaduran Virgin on the hill of Tepeyac after his arrival in 1521. His devotion transpired ten years before the Virgen de Guadalupe appeared to Juan Diego. La Virgen de Guadalupe's Indian name is Coatlalopeuh. She is the central deity connecting us to our Indian ancestry. Coatlalopeuh is descended from, or is an aspect of, earlier Mesoamerican fertility and Earth goddesses. The earliest is Coatlicue, or "Serpent Skirt." She had a human skull or serpent for a head, a necklace of human hearts, a skirt of twisted serpents and taloned feet.... The male-dominated Azteca-Mexica culture drove the powerful female deities underground by giving them monstrous attributes and by substituting male deities in their place, thus splitting the female Self and the female deities. By citing la Virgen de Guadalupe's pre-Cortesian history, Anzaldúa debunks the dichotomization of women's roles and the insistence that they are mere receptacles-benignly passive and perhaps ignobly so. Her analysis also challenges the reproduction of a virgin/whore dichotomy, promulgated not only in private and public spheres but also (as I witnessed) among devotees within sacred spaces. Although many would argue, myself included, that the cult of la Virgen de Guadalupe can empower women (in particular), dimensions of the base of Guadalupan devotion-the apparition story-do indeed propagate a binary perspective. But let us judge for ourselves. According to the Nican mopohua ("Here is recounted")-the narrative of Guadalupe's apparitions to Juan Diego written in Náhuatl-between December 9 and December 12, 1531, la Virgen de Guadalupe appeared four times in New Spain. During the early morning hours of December 9, a Christianized indigenous man, Juan Diego Cuauhtlatoatzin, was walking toward the calzada of Tepeyac when he heard a lovely singing voice beckoning him to climb the hill. There he encountered a Náhuatl-speaking young woman, neither entirely indigenous nor Spanish, with long, black, straight hair parted in the middle. She wore a sash tied around her natural waist, which was customary for a woman with child. This young virgin asked him to circulate a message: build a temple in my honor. Juan Diego, awed and overwhelmed, proceeded directly to the quarters of fray Juan de Zumárraga, the first archbishop of Mexico City. After unsuccessfully attempting to communicate her request, he returned to Tepeyac where the celestial figure appeared a second time. He begged her to find another emissary, but she insisted that he persevere. Courage renewed, Juan Diego paid a second visit to the skeptical clergy, only to be denied again. He returned to Tepeyac a third time, and the Virgin promised to give him a sign on the following day. But Juan Diego did not return as promised because his uncle, Juan Bernardino, fell ill. The omniscient figure, aware and sympathetic to his hardships, forgave his absence and later cured Juan Bernardino. The fourth and most famous apparition occurred around six o'clock in the morning on December 12. On this propitious day, she filled Juan Diego's tilma-a garment made of maguey fiber worn across the torso-with scores of roses, which were uncommon in that region and especially during the winter months. Juan Diego, humbled but empowered, returned to Zumárraga with the evidence. He revealed the Virgin's image miraculously imprinted underneath the roses. His tilma, also known as the "ayate de Juan Diego," is protected today in the Modern Basilica by bulletproof glass and state-of-the-art heat sensors. Further, inscribed on the walls of that sanctuary are portions of the following message: "No estoy yo aquí que soy tu Madre? No estás bajo mi sombra y resguardo? No soy la fuente de tu alegría? No estás en el hueco de mi manto, en el cruce de mis brazos?" (Am I, your mother, not here? Are you not under my shadow and shelter? Am I not the source of your happiness? Are you not inside my cloak, in my embrace?). Many have construed the Virgin's acquiescence to Juan Diego as a representation of a woman's capacity to be instinctually compassionate-a trait that many women must fulfill or risk social and familial consequences. Scholars have addressed this implicit gender bias, but the poet Sandra Cisneros does so humorously when she questions the illogical precept that the Virgin is indeed a realistic role model. She writes, "I was angry for so many years every time I saw the Virgin of Guadalupe, my culture's role model for brown women like me. She was damn dangerous, an ideal so lofty and unrealistic it was laughable. Did boys have to aspire to be Jesus? ... As far as I could see, La Lupe was nothing but a goody-two-shoe meant to doom me to a life of unhappiness." The Guadalupanas with whom I worked, both in central Mexico and in the Midwest, never explicitly mentioned this aspect of Guadalupan devotion. It is true that many devotees admitted to emulating the Virgin, but they took their goal with a grain of salt. Most saw it as a process, an ideal they moved closer to through everyday and exceptional devotional performances. Using gender as a lens is not the only way we can analyze the Virgin's appearances in New Spain. Like any great story, the dominant symbols, images, and characters, the conflict, and the resolution of the narrative give rise to manifold interpretations and usages. Canonized by Pope John Paul II in 2002, Saint Juan Diego Cuauhtlatoatzin, for example, represents the destitute, doubt-ridden, and affronted devotees who through faith and humility acquire redemption and guidance from their mother-la Virgen Maria de Guadalupe. Juan Diego is, in many respects, the protagonist of the legend. Guadalupanas/os appropriate and reinterpret his classic hero's journey as the first peregrinación (pilgrimage), using it as a model to overcome their own hardships and circumstances. Celebrants and devotees alike propose, "La vida es una peregrinación y todos somos peregrinos" (Life is a pilgrimage, and we are all on the journey). On an institutional level, fray Juan de Zumárraga, the Spanish missionary who legitimized the apparition, despite his initial hesitations now epitomizes the benevolence and understanding inherent in the upper echelons of the Catholic Church. But there is also an aspect of eager appropriation. Guadalupan clergy in Mexico City continue to use the apparition story to sustain religious, political, and cultural power and authority in Mexico, to foster Guadalupismo throughout the Republic, and to recuperate preconquest indigenous history as they see fit. Further, la Virgen de Guadalupe's image, the principal product of the narrative, is both a Roman Catholic icon and a malleable symbol of strength for devotees across the Americas. Guadalupanas/os from Miguel Hidalgo to César Chávez, from Emiliano Zapata to Alma López have used her iconic image to spark upheaval, foster civil rights and gender equality, strengthen political campaigns, create art, preserve identity, and build communities. These material and symbolic realizations indicate some of the ways devotees entangle belief in the cult of the Virgin of Guadalupe with cultural and sociopolitical aspirations. The Guadalupan scholar Antonio Pompa y Pompa sardonically proposes, "Se ha dicho que si durante la Guerra con los norteamericanos en 1847, las tropas mexicanas hubieran tenido por bandera la Virgen de Guadalupe, habríamos ganado la guerra" (It has been said that Mexican soldiers would have claimed victory during the war against the United States in 1847 if they would have used the Virgin of Guadalupe's image on their battle flag). Certainly, as a wide range of scholarship has shown, the cult of la Virgen de Guadalupe operates as a fundamental building block in conceiving and circulating Mexico's national identity. This study acknowledges that emphasis but focuses on the ascendancy and scope of the cult, in particular, how Guadalupan devotion circumvents affiliation and/or allegiance to one nation, especially when it befits the practitioner. La Virgen de Guadalupe's sixteenth-century apparition and the sanctuaries that followed functioned as a catalyst for the Christianization and colonization of Mexico. Not only did this colonial figure-the embodiment of Iberian and indigenous spirituality-receive a shrine atop the hill of Tepeyac, but outposts also sprang up across the United States and as far away as the Philippines, Kenya, and Korea. Simply put, "the accumulation of capital has always been a profoundly geographical affair." This project concerns itself with that history. It privileges, however, the regenerative geosocial effects of that colonial moment-how adherents continue to develop Guadalupan sacred spaces across North America; how their stories and experiences cut across what the map has cut up. Using the three aforementioned Guadalupan shrines-Tepeyac in Mexico City (est. 1531); its replica, the Second Tepeyac of North America, in Des Plaines, Illinois (est. 2001); and a sidewalk shrine constructed by Mexican nationals on Chicago's Far North Side (est. 2001)-this project considers the institutional and noninstitutional production of sacred spaces among ethnoreligious communities between the Midwest and central/western Mexico on three levels: (1) spatial practices and rhetorical strategies, (2) the perspectives of those who conceptualize space production, and (3) ideas and tactics that are coded, or communicated, through symbols. I focus less on how these communities are transnational, an extensively studied idea, and more on the transnational spaces they produce with the continual transposition and circulation of idioms and practices. Considering those transnational exchanges alongside the sociopolitical and economic dimensions of built environments, this study argues that by offering the Virgin their devotional labor (e.g., pilgrimage, prayer, song, dance, and shrine maintenance) adherents develop, preserve, sanctify, and connect not only spaces but also histories and traditions across several boundaries: geopolitical, social, and institutional. Genuflection, for example, is labor. It may be a simple gesture, but it takes on a more complex valence when you take into account the history of the action-walking for hours across icy Chicago roads in early December or for days across central Mexico. Genuflection also involves social labor, which entails organizing job, family, and day-to-day responsibilities. These practices engender devotional capital, which is not "capital" in the standard sense of the term. Capital, according to a classic economist like David Ricardo, is a production factor that is neither human labor nor land property. Although Karl Marx distinguished among different kinds of capital, for him the epitome of capital was financial capital, that is, money that produced, and immediately, more money. Devotional capital reinforces our understanding of the regenerative links between religious practice and socioeconomic forces; it proposes that religious practice is capital. The devotees with whom I worked create a type of "symbolic" capital that, in Pierre Bourdieu's words, "is one for which economism has no name" and one that does not generate direct or instantaneous monetary benefits. Bourdieu speaks to the narrowness of defining exchanges as profitable based solely on monetary gain. His point is that one may acquire advantages or attain profit as easily or as effectively through symbolic exchange as through traditional business or monetary negotiation. Within and between Guadalupan sacred spaces, adherents determine, create, and circulate devotional capital according to a site-specific faith-based value system. Moreover, devotional capital may also be thought of as a vehicle; adherents communicate ways of remembering, knowing, interpreting, and coping (which may or may not be written down in a church bulletin or the latest migration/remittance report) that affect not only the quality of life for these religious communities but also the legacies they leave behind. Devotional capital thus attends to how Guadalupanas/os' religious work, however ephemeral, informs their day-to-day experiences and how the specificity of their interactions-the ways in which they themselves sort what Geertz calls "winks from twitches," or differentiate between backstage and front stage piety-yield regenerative social, economic, cultural, and political benefits. Numerous texts interpret, celebrate, and/or criticize the Virgin of Guadalupe's presence in the Americas. Certain scholarly and exegetical texts form the base of what I have come to call critical Guadalupan studies. Although wide-ranging, the canon does not include an analysis of the long-standing transnational dimensions of Guadalupan devotion-the dynamic symbolic, architectural, material, ideological, rhetorical, and cultural exchanges and transpositions occurring among devotees in different locations. Offering a multisited examination of the production of sacred space is the principal way in which this project contributes to the expansive corpus of Guadalupan literature. In addition, this project continues discussions in the study of primarily Spanish-speaking ethnoreligious communities residing in North America. Although there are terrific explorations of Latino religious cultures and idioms, I hesitate to use the blanket term because this study does not only focus on "Latinos"; it also attends to the ways in which individuals and groups from a range of subject positions engage, confront, and/or counter the cult of the Virgin of Guadalupe. Moreover, many of the people with whom I worked identified themselves not as Latino but with a precise response about their regional and cultural bearings. This precision sheds light on the complex questions informing this study. Understanding how conceptions of sacred space production differ among urban, suburban, and rural areas, for example, begins with how and where devotee-residents have developed their identities. This study complements ethnographic, sociological, and historical analyses that consider the transmigration and settling processes of ethnoreligious communities. Many studies about diasporic religion, Guadalupan and otherwise, elide a discussion of the secular regenerative effects of spiritual practices, specifically, the ways in which religious rituals engender socioeconomic benefits. I attend to these aspects of religious practice with the terms devotional labor and devotional capital, examples of which are interwoven throughout the text. For many devotees, many of whom are struggling working-class and/or undocumented, day-to-day coping tactics are contingent on the recitation of prayer, attending church, giving tithe, sustaining sacred space, and demonstrating belief in public. What follows is a contextualized examination of those processes. It is an inspired study equally informed by theory and practice; a true labor of love, as Dwight would say, earnestly trying to address the complexity of three disparate but undeniably interconnected spaces that have risen (and continue to rise) across North America. The conceptual order of a book can take many forms. This project began in Chicago and crossed not only the U.S.-Mexico border but also the Atlantic Ocean several times. Writing the manuscript did as well. The research process is in many ways a system of checks and balances. Even so, it is difficult to avoid Geertz's all-too-true assertion that "culture exists in the trading post, the hill fort, or the sheep run, anthropology exists in the book, the article, the lecture, the museum display, or, sometimes, nowadays, the film." I was urged during the last stage of book production to change the order of this book, to begin the anthropological analysis in central Mexico, which would undoubtedly highlight the compelling stories and socioeconomic analysis of women making space sacred. After giving it serious thought, I decided to keep the initial conceptualization. I do not want to suggest that central Mexico is a logical starting point. Nor do I want to perpetuate origin myths or notions of religiocultural authenticity. We do not have to default to the geopolitical boundaries that establish the Mexican nation-state and by association Mexican symbols to truly understand the Virgin of Guadalupe. As we will see, Guadalupan devotion exists in a realm of simultaneity. Therefore, we begin the journey with our feet firmly planted in two places-in Mexico City and Des Plaines-our eyes on multiple communities, their diverse histories in our pockets, and, most important, sensuous attentiveness. Because this is a multisited ethnography of primarily Spanish-speaking devotees in central Mexico and the Chicago area, I interweave Spanish words and phrases throughout. I have translated all quotes from Spanish to English. This includes formal and informal interviews, scholarly texts, and periodicals. I have left proper names and places in their original tongue. The Virgin of Guadalupe, though quintessentially Mexican, inspires devotion throughout the Americas and around the world. This study sheds new light on the long-standing transnational dimensions of Guadalupan worship by examining the production of sacred space in three disparate but interconnected locations—at the sacred space known as Tepeyac in Mexico City, at its replica in Des Plaines, Illinois, and at a sidewalk shrine constructed by Mexican nationals in Chicago. 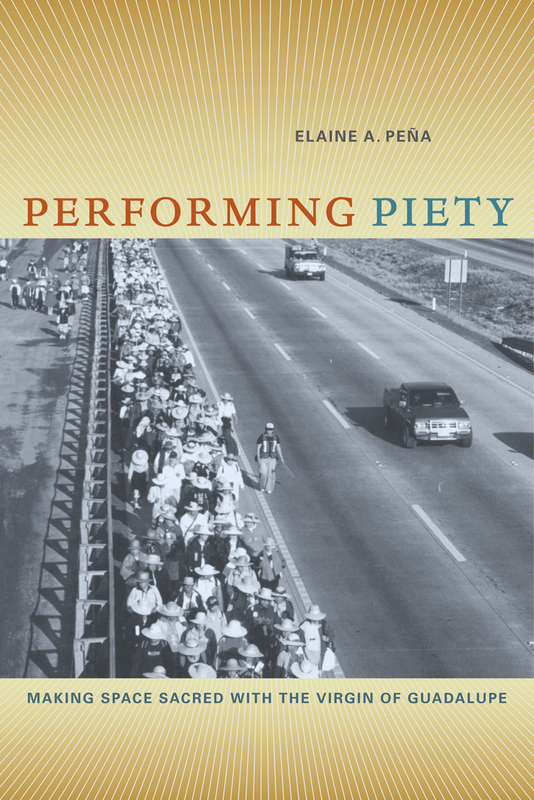 Weaving together rich on-the-ground observations with insights drawn from performance studies, Elaine A. Peña demonstrates how devotees’ rituals—pilgrimage, prayers, and festivals—develop, sustain, and legitimize these sacred spaces. Interdisciplinary in scope, Performing Piety paints a nuanced picture of the lived experience of Guadalupan devotion in which different forms of knowing, socio-economic and political coping tactics, conceptions of history, and faith-based traditions circulate within and between sacred spaces. Elaine A. Peña is Assistant Professor of American Studies at George Washington University.